Vlingo is new Free application with voice recognition function for iPhone and iPod touch. For using the app you have to tap on Press & Speak button and Vlingo turns your spoken words into e-mail and text massages, dials phone number from your contacts, searches for information on the web and updates your Twitter and Facebook statuses. The app works as follows: It copies your recording to Vlingo's servers, where the speech is translated to text and sent back to the app. 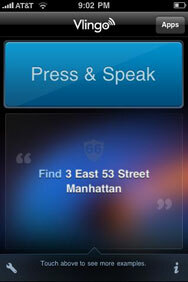 Vlingo offers to users four basic commands: Find, Social Update, Search, and Call. 1.Call selects and then dials the phone number form the contacts that you have requested. 2.Social Update posts status updates to Facebook and Twitter. 3. Find is a map-specific command that searches for the location that may be near you via Google maps. 4. Search will perform Web searches for requested information. (Note that Vlingo had no problem Googling or Yahooing but Binging is not available). As Vlingo is free app you can also add two more features to the app for the tidy price of $9.99: e-mail and SMS paste. Both of these features work well, allowing you to compose long messages by speaking to Vlingo. Vlingo offers great voice recognition capabilities and proves to be a fantastic tool for hands-on, spoken text and e-mail messages, but on the other hand it's not a truly hands-free app, for example you have to tap the phone number you want to deal to perform the call.